Movie Review: Nightcrawler (2014)- Dan Gilroy’s Directorial Debut is an Entertaining and Unsettling Look into Exploitative Journalism | Generation Film! It takes a special kind of cynic to practice the modern news slant towards local violence because in a world where crime is going down and the reporting of it is going drastically up one can only see the tactic as the packaging of fear as a product to be consumed. And what is Fear? According to the sleazy, manipulative, and sociopathic protagonist Louis Bloom (Jake Gyllenhaal) of accomplished screenwriter Dan Gilroy’s directorial debut Nightcrawler it appropriately stands for “False Evidence Appearing Real.” Bloom is an embodiment of the toxicity ingrained in modern journalism where ethics are thrown out the window trading factual accuracy for lowbrow scandal creating a world where headlines dominate the culture in a breaking the news first obsession while retractions with realized facts never make the prime news cycle or the front page. Sensationalism sells so manufacturing mass insecurity is merely the pessimistic relationship between immoral opportunists and a pervasive symptom of collective schadenfreude that guides ratings driven news that acts more like a circus than actual journalism demonstrated in poetic literalism in Billy Wilder’s Ace in the Hole (originally titled The Big Carnival). Nightcrawler acts as a demon child between Billy Wilder’s aforementioned immoral journalist exposé and Sidney Lumet’s cynical broadcast news criticism Network that possesses its own unique sleekness making it a rare example of pulp noir that has an entertaining undercurrent of satirical wit. Just as it is with most satires Dan Gilroy’s thriller balances on the line of outlandish exaggeration and an almost keen sense of perceptive reality that allows situational extremes to act as a socially conscious allegory for the immoral journalistic diaspora. Certainly the message at the heart of Dan Gilroy’s satirical thriller has been tackled before in countless ways almost bordering on incessant but it doesn’t hurt to be reminded of the cynicism that drives ratings driven news, especially in a film that is as perceptively excoriating and creepily entertaining as Nightcrawler. Louis Bloom’s predatory sense of ambition is what drives the central themes of Dan Gilroy’s script, a character aspect that is carefully designed to hoist an unflattering yet infinitely fascinating mirror up to our societal ailments that create sociopaths such as this. It isn’t necessarily an ambition for money or wealth despite the film introducing Bloom as a drifter who peddles stolen wire, copper, and steel with vehement bargaining in a desolate economic Los Angeles for Bloom has much higher aspirations towards staking a claim in a form of business that he can call his own, which he finds in the feeding of violent images to the voracious jaws of local TV news. What begins as a curiosity ignites into an obsession as Bloom quickly learns the value of blood-soaked entertainment capturing car crashes, house fires, and even home invasions with the help of a police scanner, a cheap video camera, and an unpaid intern named Rick (Riz Ahmed). He develops a merchant of death relationship with local news director Nina Romina (Rene Russo) who instigates Bloom’s void of human consciousness with her equally questionable morals for trashy entertainment describing her newscast “as a screaming woman running down the street with her throat cut.” These peddlers of violence and fear are deemed nightcrawlers, which an apt title for the serpentine predators who roam the nocturnal devastation and Louis Bloom is the very embodiment of this societal sleaze and corruption. Soulless, unfeeling, and smooth, Bloom is the visage of sociopathic ambition as he possesses the societal alienation of Taxi Driver’s Travis Bickle, the smooth-talking larger than life charisma of Ace in the Hole’s Chuck Tatum, and the disillusionment of King of Comedy’s Rupert Pupkin. Gilroy’s script is cleverly designed in its ability to transition from cynically harrowing to darkly humorous all because it solely focuses on Bloom as his constant blurring of ethical lines builds with relentless tension and drives home the message that his madness is merely a symptom of our own society’s conditions. Gilroy is not unfamiliar in the realm of screenwriting having had a relatively successful career as a screenwriter that included participation in the complexly fascinating fantasy tale of Tarsem’s The Fall and penned the serviceable Bourne Legacy reboot with his brother Tony Gilroy. However, Nightcrawler takes his writing a step further mostly due to a confident execution as Gilroy also serves as director and auteur of his pulp thriller and media exploitation piece. With satire in mind Gilroy creates an exaggerated reality not completely unrecognizable of our own and gives his envisioned satirical world some dramatic gravitas and moral weight in character, visual atmosphere, and biting criticism. Even from the outset Gilroy’s darkened and economically desolate Los Angeles is captured with beautifully menacing cinematography from Robert Elswit (The Town, There Will Be Blood) giving the film a visually palpable feeling of uneasiness that remains reliably consistent throughout. Complimenting that sense of unease is the haunting score from James Newton Howard (The Hunger Games, The Bourne Legacy) that textures the creepiness of the film instead of distracting you with the spectacle of sound. The visuals and score are merely technical aids towards the film’s unsettling tone as Gilroy showcases a rare understanding of thriller pacing that modestly and effectively creates natural suspense and thrilling entertainment. 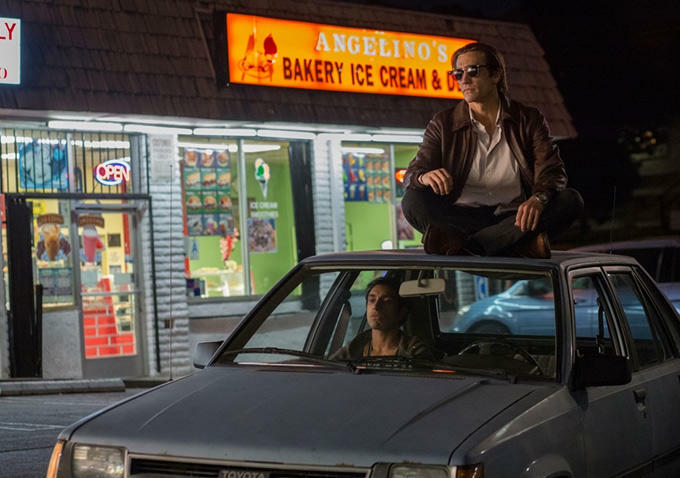 Nightcrawler maintains a sense of curiosity by keeping the audience imbalanced from drifting in and out of fascination and dread towards Louis Bloom’s actions where we often times root for his charismatic ambition and yet are morally offset by the lengths he goes to obtain it. Gilroy has confidently created a thrilling neo-noir genre piece that also possesses layers as an equally fascinating character study and a biting satirical criticism on media that only falters on occasion as it sometimes enters the realm of being hypocritical towards its exploitation criticism. 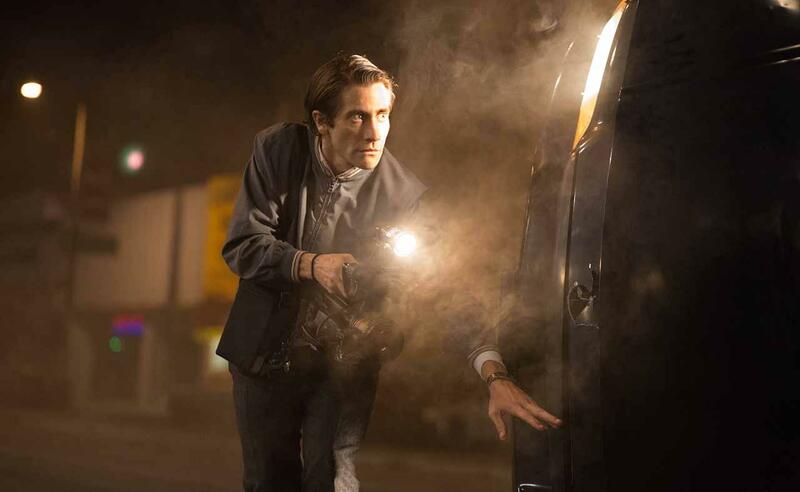 However, the constant messaging is only a minor distraction because ultimately Nightcrawler becomes a tactfully made thriller that allows for one hell of a tour de force performance for the emerging talents of Jake Gyllenhaal who seems to want to push himself in his acting maturity. If Gyllenhaal even attempted the kind of role given to him with Nightcrawler even three years ago he simply wouldn’t have been able to accomplish the task because it’s a role of discipline and meticulous detail that has an emphasis on gestures, facial subtleties, and a full dedication to verbal accuracy that wasn’t even touched upon in his roles of the past. Only recently has Gyllenhaal pushed himself beyond his expectations by tackling roles that are layered in character, such as the abrasive detective in Prisoners or the duel Kafkaesque performance in Enemy, rather than roles that are solely dependent on dramatic flair (Rendition, Brothers). Capturing Louis Bloom must have been a thrilling task because Bloom is chameleon of sorts, or rather a sponge for ambitious corporate speak and interpersonal jargon that are confident ramblings of a rather incoherent man. He’s too literal-mindedness to understand normal social cues and yet has an incredible aptitude for manipulation with either blackmailing Nina with a thorough understanding of her professional position or convincing his employee Rick to do what he wants despite Rick’s vestigial sense of right and wrong. On paper it would seem that Louis Bloom is an inconceivable character in reality due to his relative moral structure and eerily acute cleverness and yet Gyllenhaal makes him thrillingly real with every forced smirk and his carefully pronounced vernacular. Though this is Gyllenhaal’s vehicle to drive he certainly has come capable passengers along with him, especially with Rene Russo who utilizes a sensual confidence to create a chilling interpretation of an ethically dubious news director that resembles Faye Dunaway’s Diana Christensen in Network. As Bloom’s right hand homeless employee Rick, Riz Ahmed gives a distressing performance that ignites some of the best interactions of Nightcrawler where Jake Gyllenhaal’s verbal elegance soars as he ethically rationalizes his business. Everything from Gilroy’s creation to the confident performances from the rest of the cast (including the great Bill Paxton in delightful pulp form) services Gyllenhaal in igniting an incredibly creepy and completely fascinating sociopathic character that really becomes a role of a lifetime for Gyllenhaal’s maturing abilities. Satire is supposed to be outlandish and exaggerated and although Nightcrawler sometimes enters the realm of questionable belief there is enough thrilling entertainment and perceptive criticism that allows its slickness to become an awful lot of guilty fun. Protagonist Bloom might also be an exaggerated entity in thin moral structure and sociopathic ambition, but there’s no denying that his voyeuristic appetite is not too unfamiliar to the masses who indulge in fear driven insecurities that plague media sweeps campaigns. Desperate to find a purpose Bloom realizes he has a gift for the repugnant reportage that defines modern journalism for touting sensationalism over facts and creating a heightened sense of fear where there might not be a danger of it at all. Gyllenhaal’s Bloom might not reach the artistic level of sociopathic alienation as Robert De Niro did with Taxi Driver nor does Dan Gilroy’s film enter the classic realm of scathing media criticism such as Billy Wilder’s Ace in the Hole, Alexander Mackendrick’s Sweet Smell of Success, or Sidney Lumet’s Network, but it comes diabolically close. Nightcrawler works as a sleek and unnerving thriller that incorporates bleak humor and insightful reflection on our current journalistic standards that is really heightened by a tour de force performance making it a film that entertains and disgusts in equal measure.